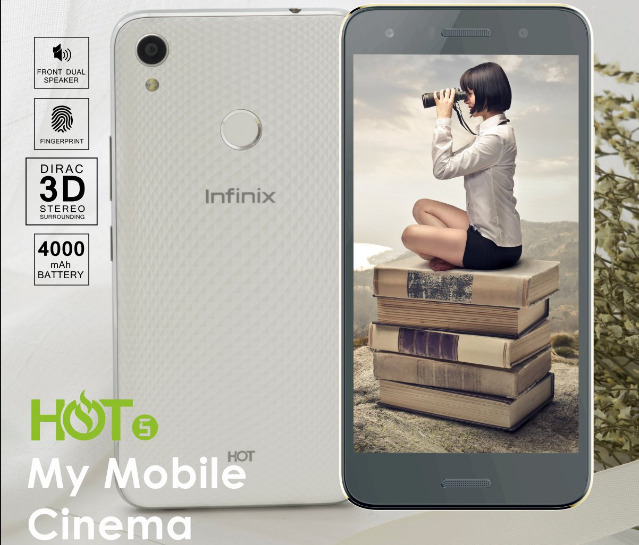 INFINIX HOT 5 is the fifth generation in the INFINIX Hot series of affordable smartphones. The device packs a powerful battery, fingerprint scanner and Android 7.0 (Nougat). Infinix Hot 5 is the successor to the previous INFINIX Hot 4. It follows the league of coming in two versions unlike the Hot 4 that came in three versions, Hot 4, Hot 4 Lite and Hot 4 Pro. The INFINIX HOT 5 has a LITE version, the Hot 5 and Hot 5 LITE is an affordable middle range smartphone with good performance and enhanced features. With the aid of the Dirac Stereo WideningTM technology, the Hot 5 and Hot 5 LITE creates realistic entertainment with high-impact audio & video using 3D Stereo surrounding. The Hot 5, dubbed as ‘mobile cinema,’ sports a large display size of 5.5-inch IPS display, with a 720 x 1280 pixel in resolution to offer enjoyable, wide screen viewing experience. The device is not a high end device but you can expect an improved performance better than some other average budget smartphone. The Infinix Hot 5 runs on Android 7.0 Nougat based on Infinix’s XOS UI that is fully equipped with a quad-core MediaTek processor clocked at 1.3 GHz. This is likely to give it an extra boost with a Ram of 2GB of RAM. Infinix Hot 5 boots version 2.2 of its maker’s XOS software. No nagging while multitasking. One major point or the main selling point of the Infinix Hot 5 is the large battery capacity and that is why I included it in the List of Smartphones with Long Lasting Battery. It is packed with a colossal 4000mAh battery unit under the hood. You can expect about 4 hours of talk time from a 5-minute charge with fast charge technology support. The rear mounted fingerprint scanner adds to the appeal of the Infinix Hot 5. But the devices don’t have 4G LTE network support. The Infinix Hot 5 is currently available in Nigeria, Kenya, and Ghana. It can be purchased from online stores in the countries of the shops. Infinix Hot 5 Price ranges between 35,500 Naira and 45,000 Naira in Nigeria, depending on your location in the country. Compared to the price of the Hot 5, the pros greatly outweigh the cons. So, I can recommend this device to anyone looking for a cheap or affordable device with long lasting battery. The camera is 8MP back, so don't expect much because of the price. This is an average or middle range device. The Hot 5 LITE, is also dubbed as ‘mobile cinema,’. It has almost same features as the HOT 5, it also sports a large display size of 5.5-inch IPS display, with a 720 x 1280 pixel in resolution. The device is the lower version of the Hot 5 and also an average budget smartphone. The Infinix Hot 5 LITE runs on Android 7.0 Nougat based on Infinix’s XOS UI that is also equipped with a quad-core MediaTek processor clocked at 1.3 GHz. This is likely to give it an extra boost with a Ram of 1GB of RAM. Infinix Hot 5 boots version 2.2 of its maker’s XOS software. The large battery is also the selling point of the Infinix Hot 5 LITE and I also included it in the List of Smartphones with Long Lasting Battery. Packed with a 4000mAh battery unit under the hood. You can expect about 4 hours of talk time from a 5-minute charge with fast charge technology support. The fingerprint sensor is missing in the Infinix Hot 5 LITE and the devices don’t have 4G LTE network support. The Infinix Hot 5 LTE is currently available in Nigeria, Kenya, and Ghana. It can be purchased from online stores in the countries of the shops. Infinix Hot 5 Price ranges between 30,500 Naira and 38,000 Naira in Nigeria, depending on your location in the country. If your budget is less than the INFINIX HOT 5, you can go for this LITE since the only thing missing is fingerprint scanner and 1GB of Ram size. So, depending on your budget, you can make choice.